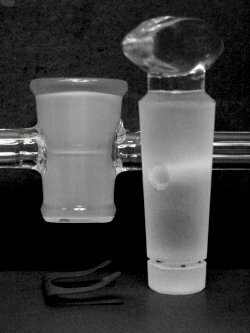 While master glassblowers know how to hand tool and grind their own glass joints and stopcocks, the time and effort these tasks require are considerable. Therefore, most glass systems constructed by scientific glassblowers today utilize mass-produced components. Industry accepted standards allow, with some exceptions, interchangeable connections no matter the manufacturer. The glass components on this page are a representative sample of joints and stopcocks commonly found in the glassblower's shop. Size references are in mm (millimeters). 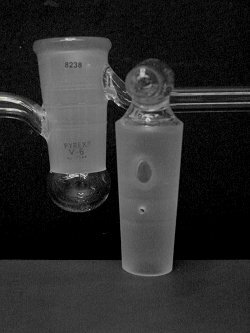 These joints connect glass apparatus and/or components such as flasks and condensers. They are usually used with a sealing grease applied between the two (inner and outer) joints, but thin Teflon® sleeves or rings can be used instead. Poor seals and stuck joints are often the result of using connectors "dry", improper greasing, or leaching of the grease by solvents. Sizing is given in the form 24/40, where the first number is the approximate OD of the inner joint at the largest end and the second number represents the approximate length of the ground portion of the joint. Standard taper joints come in a variety of standard sizes. These joints also connect glass apparatus and/or components. Unlike the fixed and rigid standard taper joint, the ball and socket joint design allows limited side to side movement. This flexibility can be helpful in glass systems where alignment is a problem. Most ball and socket joints are used with grease, but versions are available that incorporate the use of O-Rings or Teflon® coatings to aid in sealing. A pinch clamp is used to hold the ball and socket together. Sizing is given in the form 18/9, where the first number represents the approximate OD of the ball and the second number is the ID of the tubing. Threaded connectors offer an alternative to the standard taper ground joint. The greaseless seal is made by O-Ring compression using threaded connectors with internal or external threads. 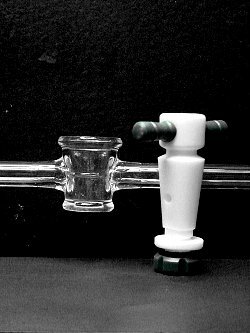 The versatility of this type of connection is useful to laboratories without quick or easy access to a professional glassblower. They can be used to make connections of dissimilar materials; for example to connect a metal thermocouple gauge tube to a glass vacuum line. Size references (# 7, 11, 15, etc.) may indicate different measuring points depending on the manufacturer and the type of thread. These connections have a range, not a set size, that is partially determined by the size of the O-Ring used. Note: connector threads are not necessarily the same as cap threads. Consult your manufacturer's technical service department for additional information. This style of connecting joint works well when assembling components within a limited space or where contamination, streaking, or leaks from greased joints are a concern. The seal is made by compression of the O-ring with a pinch clamp. 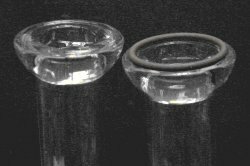 The glass joint can be used without grease, though some will lightly coat the O-Ring with grease in the belief they will get a better seal. A wide variety of O-ring materials is available depending on your application and the solvents used. Viton®: is a good choice for common laboratory work. The size # is usually the ID of the joint/tubing. A #25 O-ring joint has a 25 mm opening or ID. 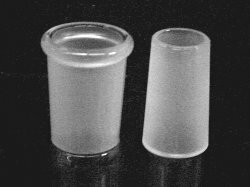 These stoppers are commonly used on volumetric flasks, separation funnels, old-style acid bottles, etc. They have a shorter ground portion (length) than found on most standard taper joints and are not interchangeable with standard taper joints or stoppers (although this doesn't seem to stop a lot of people). If you are not sure whether a stopper or joint is standard, look for standard taper markings. Most stopper plugs are solid with the size # usually representing the approximate the OD of the plug at its largest point. These are standard glass valves used for non-vacuum systems and apparatus. 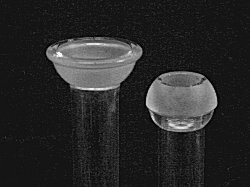 The glass plug is usually solid, exposed at the upper and lower ends of the taper, and retained in the glass barrel with a clip or washer. Plugs are standardized and interchangeable within their size. They must be greased. The stopcock size is determined by the diameter of the hole (bore) through the plug. 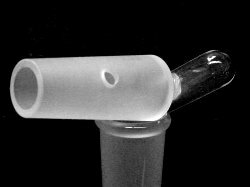 A 4 mm stopcock has a hole 4 mm in diameter through the plug (not to be confused with the inner diameter of the glass tube attached to the stopcock barrel). 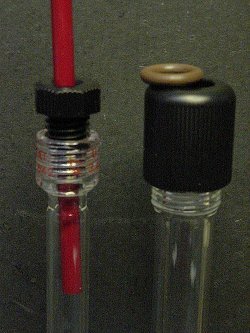 Note: Glass stopcock plugs can not be used in glass barrels designed for teflon plugs. Visually check all glass plugs prior to using, confirming that the plug aligns with the bore in the barrel. 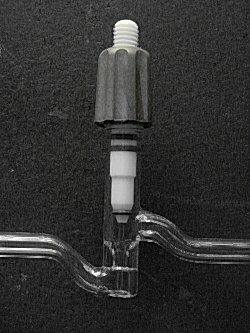 This is a common glass valve used for non-vacuum systems and apparatus where grease can not be used. The Teflon® (a trade name for PTFE = polytetrafluoroethylene) plug is exposed at the top and bottom of the taper and retained in the barrel with a Teflon® washer, o-ring and nut (in that order). Note the barrel of Teflon® plug stopcocks is smooth and polished, unlike the ground finish found in glass plug stopcocks. Stopcock size is determined by the diameter of the hole through the plug - not the ID of the tubing attached to the stopcock barrel. Note: Teflon® plugs cannot be used in glass barrels designed for glass plugs. Check the condition of the threaded portion of used plugs and the correct order, teflon washer, o-ring and nut, of the components before using. Unlike standard non-vacuum stopcocks, most high-vacuum valves minimize potential leakage by leaving only one end exposed to the atmosphere. The lower sidearm may come off a bulb as shown in this example, or it may come off of the barrel itself. In either case, the lower sidearm should always face the source of the vacuum. These valves are must be be used with high-vacuum grease, and the grease must be carefully applied. Stopcock size is determined by the diameter of the hole passing through the plug. Notice that this design exposes the internal portion of the plug to the system. 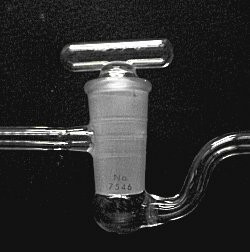 Glass high-vacuum stopcocks come in many styles and varieties. The one shown here gives the user a few more options in retaining the plug vacuum when opening the system to atmosphere. The small hole in the plug, directly below the plug "bore", is aligned with the lower sidearm (vacuum source) and evacuated. The photograph does not show it but the "bore" is actually a tube passing through the plug. This feature isolates the system from the vacuum held in the plug. Once evacuated, the back of the plug does not need to be exposed to the system or vacuum again. However, if one attempts to use the system without evacuating the rear of the plug, the plug could pop out when turned. Numbering. 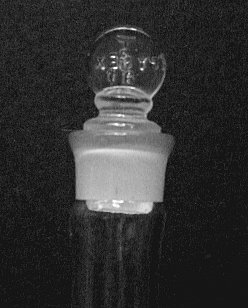 All glass high-vacuum stopcock plugs and barrels are numbered and matched. They are ground to tighter tolerances than standard stopcocks, plugs and barrels and they are notinterchangeable (at least if you want to achieve high vacuum). Always check the number on the plug and barrel before assembling a high vacuum glass stopcock. Should the glass plug break, one has to order a replacement plug and then grind both the plug and barrel using increasingly higher grit numbers of carborundum. To avoid this tedium and expense, some laboratories will connect the plug and barrel with a loose loop of copper wire so that the plug can never be dropped or mixed up with other plugs in the system. Teflon® style vacuum valves are found in systems where stopcock grease will contaminate the system or make cleaning the system difficult (grease tends to leach and hold onto impurities). Teflon® valves are available in a variety of o-ring and plug compositions. 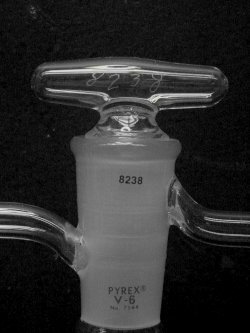 Unlike glass high-vacuum stopcocks, the plugs are interchangeable, making replacement less expensive for the user. These advantages have led to their greater use compared to "old school" high vacuum glass stopcocks. The plug or shaft moves up and down within the polished barrel, offering a range of openings. They are typically listed by the variable bore sizes 0-4, 0-8, etc that these plugs offer. The tips may make an o-ring to glass or Teflon® to glass seal depending on the style.